Navigate to Ultimate BB » Book Information and look for the section called Add Schema Markup. Switch that to "On" to enable the feature. Next, scroll down to the Configuration section with the "Enabled" and "Disabled" boxes. Drag the Schema - Start box into the "Enabled" column if it's not there already. 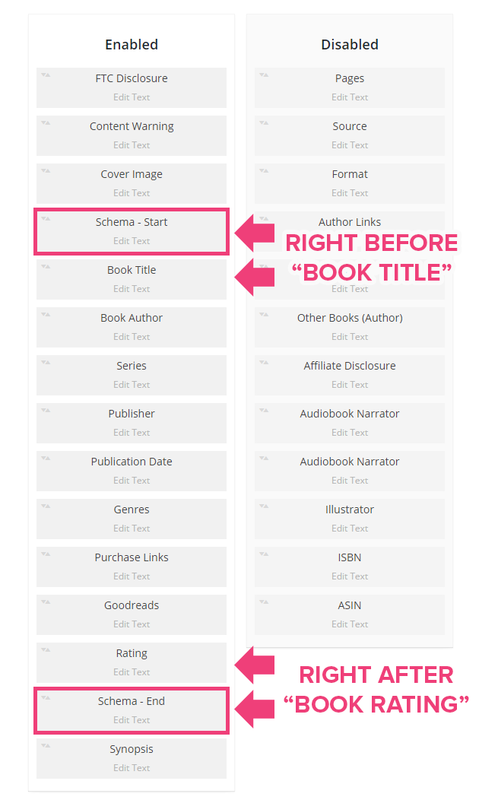 Make sure it's placed above the "Book Title" box. Then, drag the Schema - End box into the "Enabled" column if it's not there already. Place it directly after the "Book Rating" box. It's extremely important that you get the placement right, otherwise the schema markup will not work. Google may not pick up on all your old reviews right away. Eventually, Google will pick up the schema markup for your old posts, but it won’t happen immediately. Google will have to revisit/reindex all of your old reviews in order for them to pick up on the ratings. However, all of your new posts should have the stars applied immediately. You can test to see if the schema markup is working by putting the URL of one of your blog posts into the Google Structured Data Testing tool. Only do this after you have properly configured it using the instructions above. If the tool shows the star ratings in the preview, that means it's working. If your theme has other schema.org markup, the ratings might not work. I've found that if you have this markup nested inside other schema.org markup, it doesn't always work. This is out of my control since it's something that your theme may or may not apply.